Six people were injured on a plane during a bout of turbulence, and shocking photos of the aftermath have gone viral. Pictures from the Thai Airways flight appear to show blood on the seats. Pillows and food were also seen scattered in the aisle. The plane was flying above Singapore on April 11 when the flight hit turbulence. Six people were sent to the hospital as a result, Yahoo 7 reported. All those who were injured have since been released. SarahJayne Edwards, 39, said she was incredibly nervous on the Jakarta to Bangkok flight. Edwards said she started to compose a letter to her husband in case the plane went down. “I grabbed (her three-ear-old daughter) AsiaLilly and cuddled her and told her we had hit a raincloud so it was going to feel like a rollercoaster. Broke my heart when she said ‘mummy I’m scared!” she wrote, according to MailOnline. The blood on the seat came from a man who wasn’t wearing his seatbelt. He hit his head after he was tossed into the air. Airline staffer Kru P’Birth posted photos on Facebook, showing the chaotic aftermath. 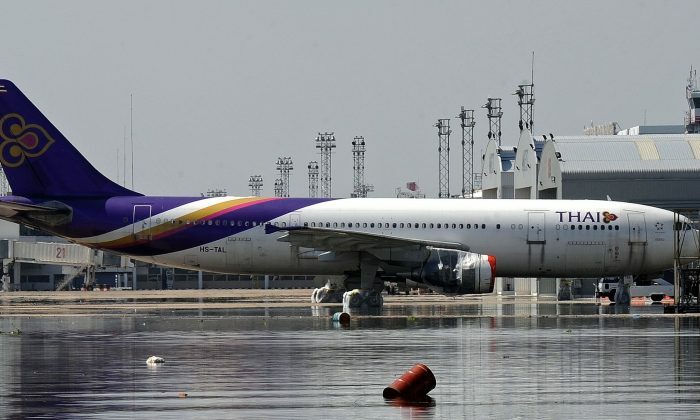 Thai Airways issued a statement apologizing for the incident, while praising the pilots for getting the plane down safely.